It's no secret: I like free stuff. Who doesn't? (Ok, with the exception of people who are overly suspicious of free goods or deem themselves "above" taking freebies) And with the demise of free papers that used to be handed out on the street, such as London Lite and The London Paper (I only liked those because they were 20% (sensationalized) news, 80% celebrity gossip), I find myself reading my free books from work on the tube now, which isn't such a bad thing, if I'm to fulfill my goal of reading 27 books before my 27th birthday this year. 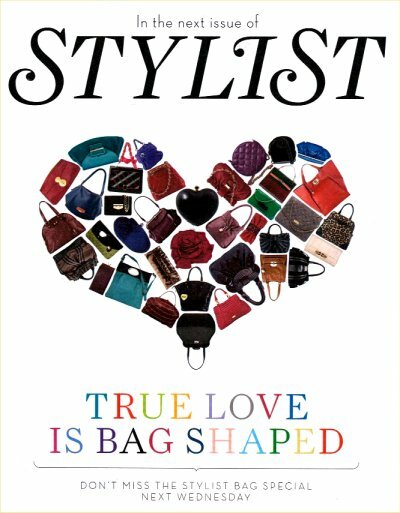 But I just can't hide my joy at receiving the free Stylist magazine, which started at the end of 2009. As it's aimed at "affluent career women" (which I am sweetly but constantly reminded of that that's not me, due to the Miu Miu, Prada, and Mulberry bags and shoes splashed on every page), I often get it confused with its paid-for counterpart, Grazia, the fashion glossy I sometimes splurge £1.95 for. There's nothing that delights me more on Tuesday evenings or Wednesday mornings (when Stylist is handed out) than to grab the thin but chock-full-of-great-eye-candy (eye-candy for me = gorgeous shoes, bags, travel destinations, food and interiors) magazine from its distributor. In fact, I inwardly laugh at the women who bypass the magazine. Who would? Clearly they have no idea what they're missing. The pages may not be as pretty as your usual glossy and not as thick, but the quality is surely there: this week's issue boasts an exclusive interview with Christian Louboutin and a feature on fashion icon Grace Kelly. Every issue includes short day-in-the-life-type snippets of a typical high-ranking London career woman describing how she takes her skinny mocha latte and what time the nanny arrives at her Hampstead Heath pad to take care of the children she hardly sees. There's even a page devoted to love-to-hate-her-young-woman-of-the-moment Dawn Porter and her opinions on everything from marriage to heels. In short, the magazine is a summary of and glimpse into a life that I don't have - and don't necessarily want. But still, come every Tuesday/Wednesday, I greedily lap it all up on my train ride home.